Posted on May 4, 2016 by No Map Required Posted in Art, Art & Engineering, Places, United States, Washington	. Long-time readers will know that Anner and I have sort of gotten caught up in the world of textiles. In fact, that might be a bit of an understatement. From the embroidery work in Peru to the amazing printed designs in Tanzania, the colors of the Mongolian gers to the Bali batiks, and on to the workshops we took in making pants and hats, fabrics have been enticing us with their joyous colors and magical patterns. Now that we’ve opened all our boxes, as you saw in the last post, and gotten the chance to look at all our bright treasures once again…we just want more, more, more! Now that we’re home and getting back into the swing of Seattle life again, I’ve been planning to bring that textile-love into my own art. Yep, this boy is going to learn to sew! Now you know that I’m a bit of a tool hound, so there was no way I could limit myself to hand-sewing. 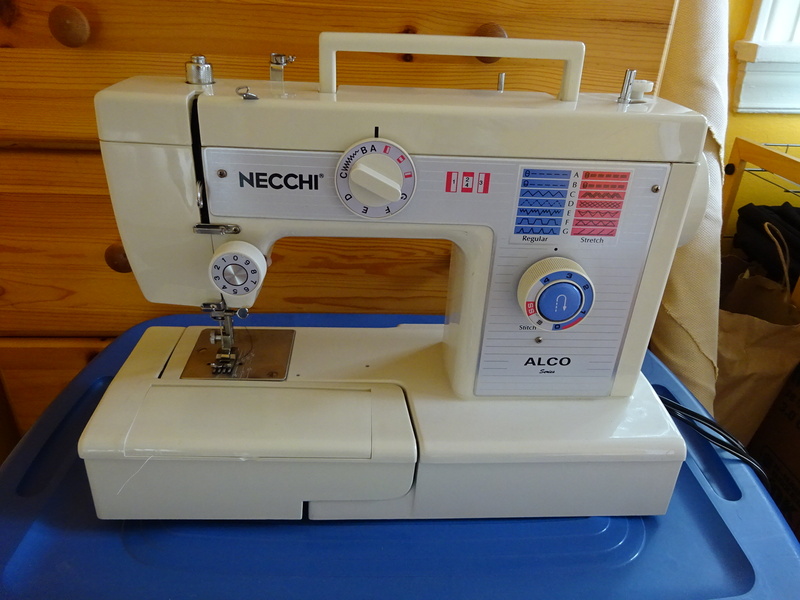 Luckily the wonderful readers of No Map Required fed my desires in a big, big way…by donating us a serger and a sewing machine!!! How amazing is that? Wonderful reader, and new friend, Allison donating us our new serger! 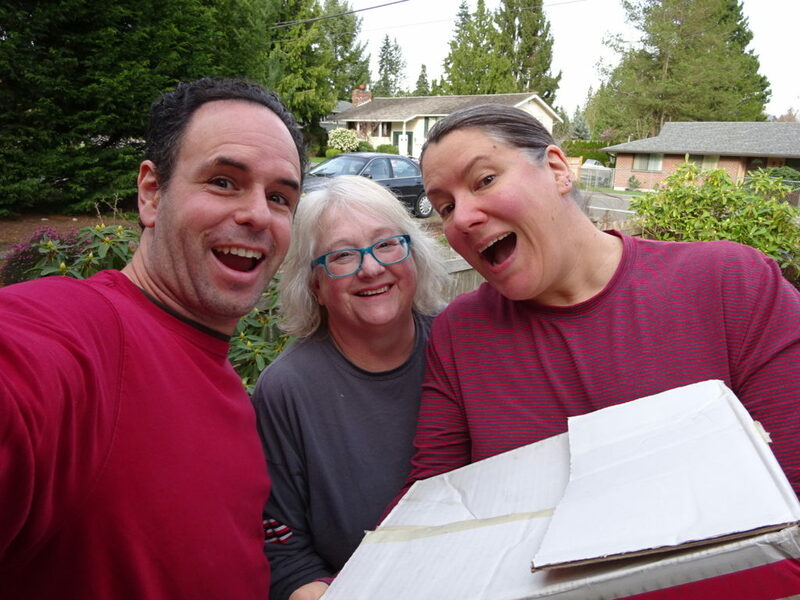 When we went up to see the daffodils a couple weeks ago, we also stopped over and met Allison who oh-so-graciously to donate her serger to us. First off, it was pretty special getting the chance to meet a reader we had never met before (Hi, Allison!) and then it got even better as she wanted to help us out with the new machine! Ahhh, new tools, how I love thee. Then we got together with our friends Jack and Anastasia who gifted us Anastasia’s old sewing machine! That was just a bonus as we were really there to have Jack’s famous blueberry pancakes…for dinner. Dee-lish-us! Anastasia warned me that it isn’t the best machine, so I’m a bit leery. Reading an online reviewer saying their machine “made them cry it was so frustrating” somehow doesn’t alleviate my worries. Still, looking forward to trying it out…and perhaps upgrading someday. Hooray for more tools! If I’m going to get creating, tools alone won’t cut it. Well, they will, but…I digress. Along with the serger and sewing machine, I’ll also need some new fabric as Anner doesn’t seem to want me experimenting with her Tanzanian textiles for some reason. No faith, I tell ya. Anastasia let me know about a spectacular sale where all fabrics were going for a mere $1/yd, so off I went. Well, apparently I wasn’t the only one who thought the price was right! 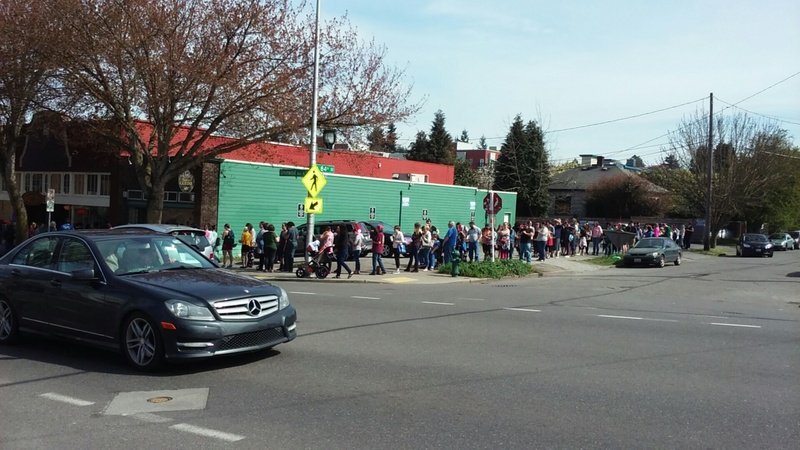 The line was over 150 people long when I arrived! Fabric options were pretty sparse by the time I got inside, but I did find some pieces of fleece to try out for hats, a heavy-weight cotton similar to the feel of our Tanzanian textiles to experiment with, and a couple of upholstery fabrics inspired by the Fashion Week pants workshop, along with some other odds and ends. Should definitely be enough to get me started. 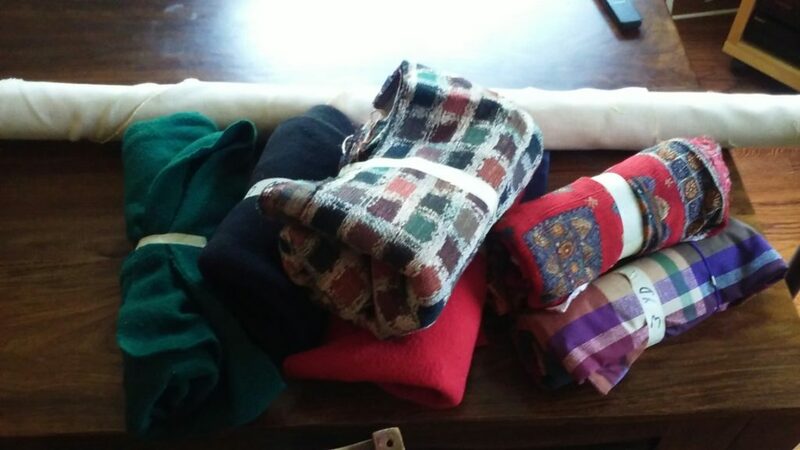 The fabrics I picked up for a mere $15! Well over 15 yards with the roll at the top. Hopefully posts showing my first hats and serger experiments will be coming your way soon. Wish me luck!!! 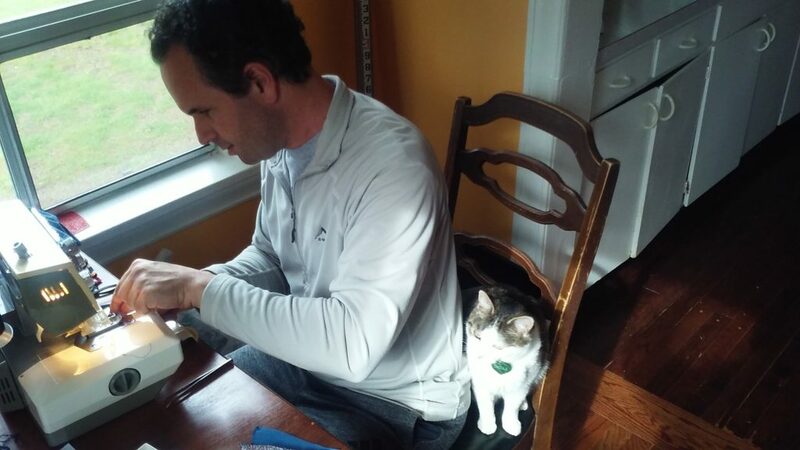 Our lovely neighbor cat, Smilla, oversaw me threading the serger at home for the first time. Exciting creations are ready to come to life! Good luck. As you must certainly already know, buying fabric can become a seriously addiction. Despite some dilatory searches, neither my neighbor and friend, Jeanne, nor I both have been able to find a 12-step program. You have seen my collection. You have taken your own first huge step into the idea of Never Enough. So, now you have been warned. Looking forward to your creations! Enjoy! Let me know if there is something I can do to help with the learning process. What a lovely thought, and what an interesting, caring dad he must have been. Very cool, Mary! Those jeans might become the star of their very own blog post some day! Thanks for sending them along. 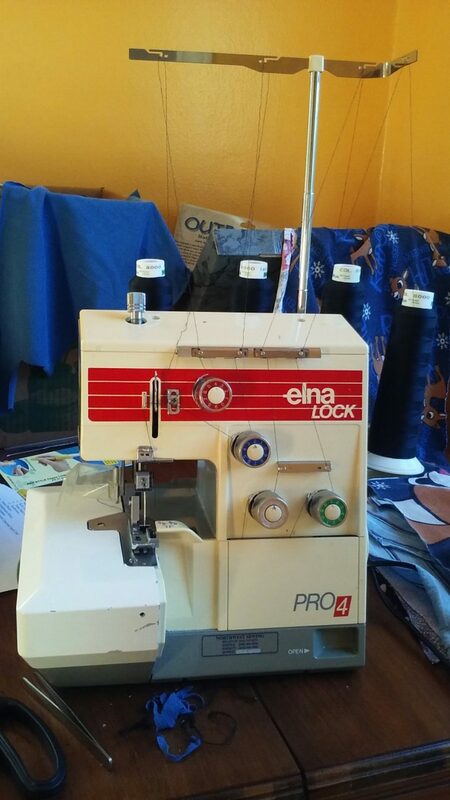 Pingback: No Map Required | Serging and Sewing: The Adventure Begins!